Some books and articles have published data about "isolation distances" for seed saving. 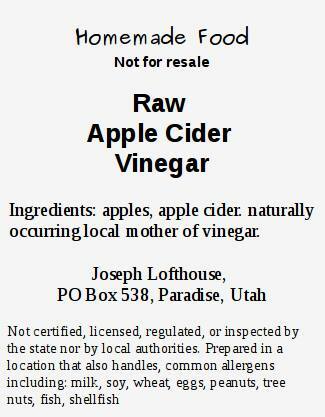 I believe that such recommendations are inappropriate for people growing promiscuously pollinated or landrace seeds. In order to keep a highly inbred variety "pure" we must isolate it by so many feet or miles from any other plant of that same species, because the variety would be ruined if pollen came in from somewhere else. I believe the main failing of this theory is the idea that highly inbred crops are somehow desirable. Perhaps they have some utility to huge commercial operations, but "pure" crops are generally a bad choice for home gardeners and for small market growers. Highly inbred and genetically fragile crops are an especially bad choice for anyone that is interested in saving their own seeds, or developing their own varieties. Pollination approximately follows an inverse square law. What that means from a plant breeding perspective is that plants are extremely likely to be pollinated by their closest companions, and unlikely to be pollinated by plants from further away. As an example, supposing we plant a small patch of carrots as a seed crop, and our neighbor also plants a similar patch. If the distance between the two crops is 32 feet, there is about a 1 in 1000 chance that any particular seed will have been fertilized by pollen from the other garden. 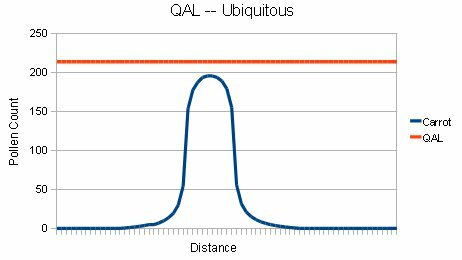 At a distance of 100 feet the odds are approaching 1 in ten thousand, and by a mile the odds are in the parts per million. Pollination does not follow a perfect inverse square law, but it is a good first-approximation. This is basically a dilution process, the further away a pollen donor is, the less likely it is to contribute pollen to our seed crop. We can use this process in reverse, by producing an abundance of our own pollen it will overwhelm what little pollen manages to arrive from far away. Growing a large enough seed crop to maintain genetic diversity also produces enough pollen to substantially dilute what is coming in from elsewhere. 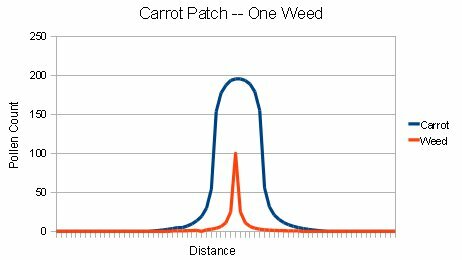 To go back to the carrot example: If we increased the size of our carrot patch by 100 X, our neighbors patch could be expected to pollinate something like one seed in 100,000. There are several natural processes that remove pollen from the environment. For example, pollen is heavier than air, and is quickly pulled to the ground by gravity. Corn pollen falls at around 0.8 feet per second, so if it is released from a height of 6 feet it would take around 5 seconds to hit the ground. In my garden in July the average wind speed is around 10 mph, so the average corn pollen grain could be expected to travel about 45 feet before hitting the ground, and after about 25 feet it would fall below the level where it could interact with silks. So in the case of wind pollination there are systems in place (gravity, plants acting as filters) that are actively removing pollen from the air and preventing it's dispersal. Less than 1% of corn pollen is lofted up by turbulence, and it's effect is rapidly diluted by distance. Screens can be an effective method of removing or diluting the incoming pollen. For example, tall sunflowers planted around seed crops will tend to distract pollinators coming in from a distance, and dilute what they are carrying. They also create more efficient settling environment for wind blown pollen. Due the the rapid decline of pollen with distance, the pollen donors that have the most impact on a seed patch are those plants that are growing within the patch. If there is a rogue plant among the parents it will have a much larger impact on the descendents than a little bit of pollen coming in from elsewhere. The detrimental effects of non conforming parents can be reduced by careful selection of parents, by weeding out non-conforming plants during the growing season, and by planting larger numbers of parents. For example: I grow a radish landrace. I also have volunteer radishes in my garden. I can minimize the impact that those volunteers have on my seed crop by planting my parents in an area where I know that radishes did not go to seed the previous year. And during the radish bloom I can keep the area very close to the radish seed patch clear of blooming volunteers. For good results I don't have to keep the entire neighborhood free of feral radishes, just the area within and immediately around my radish bed. Foreign pollen drifting in from elsewhere is substantially diluted by the vast quantities of pollen available inside the patch. Let's take wild carrots as an example: Supposing we have Queen Ann's Lace growing ubiquitously in the environment, and inside the carrot patch in equal numbers to the carrots. The carrot is more likely than not to be pollinated by Queen Ann's lace. Queen Ann's Lace weeded only out of the carrot patch. The rest of the garden not weeded. 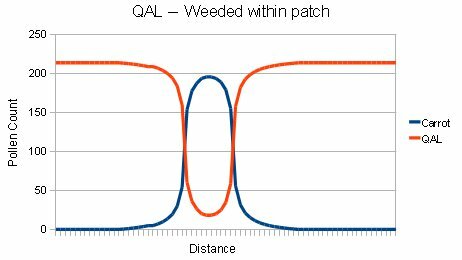 Within the center of the patch there is about a 15% chance that the carrot will be pollinated by QAL. On the edge of the patch the chances are about 50:50. With Queen Ann's Lace weeded to a distance of 15 feet from the carrot patch there is little contribution of pollen from QAL. 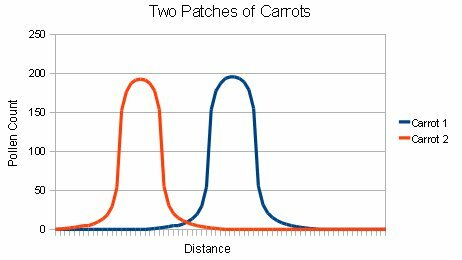 We can play other scenarios: Two carrot patches 100 square feet growing 10 feet apart from each other. About a 1% chance that the flowers along the edge of the patch will be pollinated by the other patch. 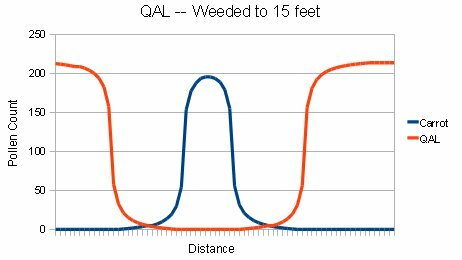 One QAL weed growing in the middle of the carrot patch results in a contamination rate of about 1%. If something, such as cytoplasmic male sterility interferes with our crop's ability to produce pollen, then pollen from further away may pollinate the crop. If there is no pollen of the same species coming in from elsewhere the plant may be so desperate for pollen to accept it even from different species or genera. In the seed industry, the term "open pollinated" has come to mean the exact opposite of its plain and common sense meaning. As used by industry, the term "open pollinated" means that any offspring will look and grow exaclty like their parents, in otherwords, they are highly inbred and might as well be clones of their parents. This inbreeding is often reinforced by selfing, growing in cages, etc: Contrary to the plain meaning of the term. Before I understood this disconnect, it seemed like a contradiction to speak of a "pure" strain of an open pollinated crop. Shouldn't the term open pollinated imply that we don't really know who the father is? In my garden I am now using the term "Promiscuously Pollinated" to call attention to the fact that I may not know much about the pollen donor, and that there is every possibility that the father might not be a functional clone of the mother. I am only growing genetically diverse crops, mostly landraces, so I don't care if I receive pollen from other sources. I propagate the best-growing most-suitable plants each year, so if stray pollen helps my crop grow better then I welcome it into my garden. If it causes something to grow worse then I don't select that plant for making seeds.